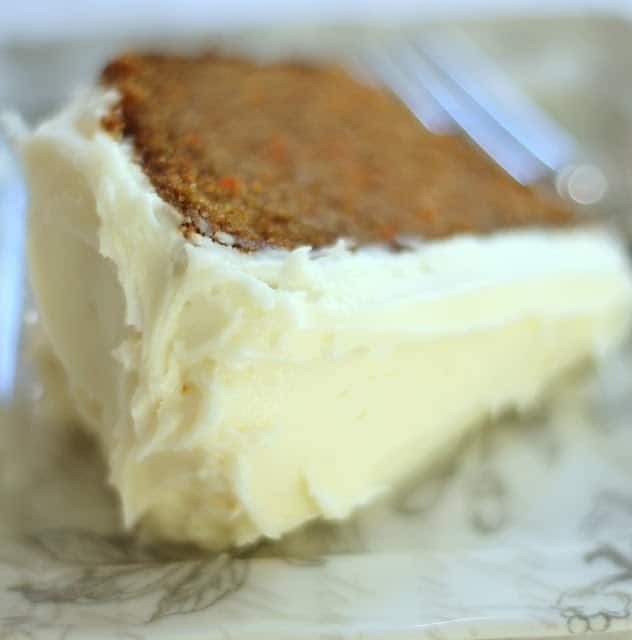 My mother-in-law introduced me to this carrot cake recipe years ago and it’s the only carrot cake I ever met that I really liked. And by like, I mean complete adoration. Complete adoration = needing to take little forkfuls of leftovers until the cake magically disappears. I’m a big chocolate girl, but I’d take this any day even over chocoloate cake with chocoloate frosting and chocolate ganache. It is that good!!! 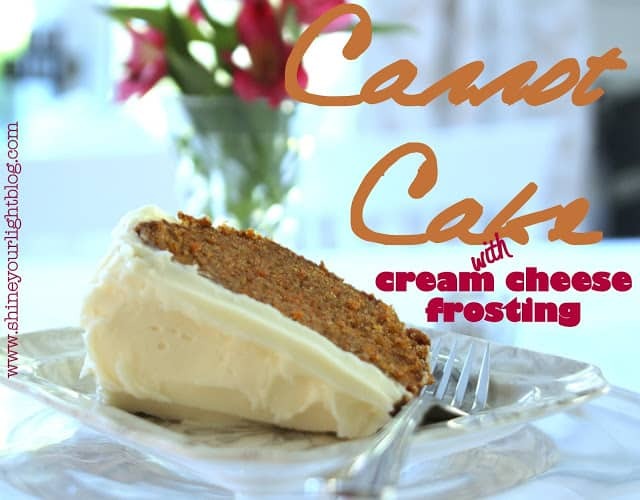 The outer shell of the cake is almost carmelized, the inside, moist and delicious. 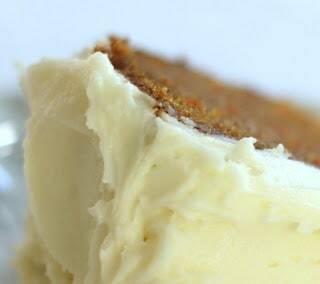 Oh and the frosting………not just buttercream, but cream cheese as well. It’s heavenly, that’s all I can say! Beat eggs, add sugar and oil, continue to beat well. Add flour, baking soda, baking powder, salt and cinnamon, beat well. Cool in pan 10 minutes; invert onto cooling rack and let cool at least 1 hour before frosting. Leave butter and cream cheese on counter to soften, about 1/2 hour, then mix. 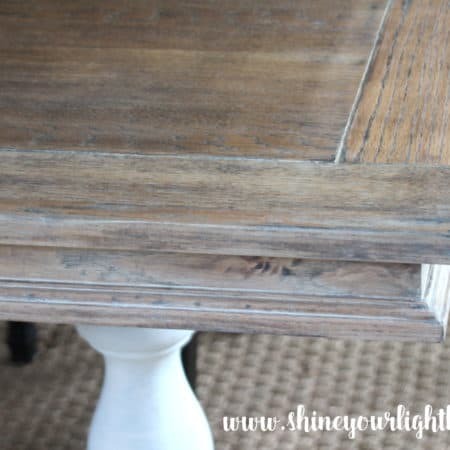 Slowly incorporate powdered sugar (so it doesn’t end up all over your kitchen! ), then add vanilla and whip until smooth. After frosting cake, refrigerate until ready to serve. This is so tempting. 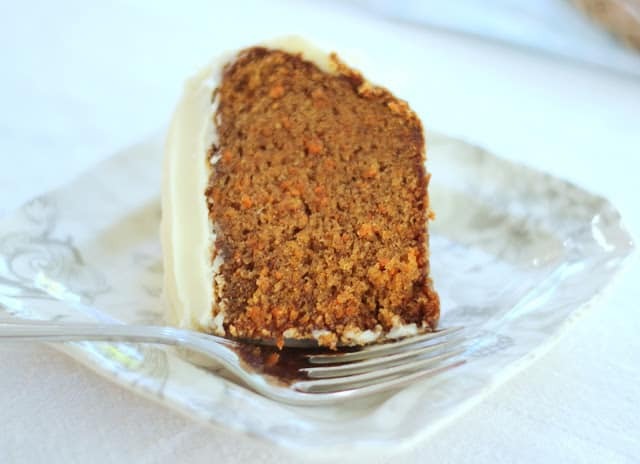 I love carrot cake and have not had it since I went gluten free. I may need to try and convert this recipe. Looks just like my mom's ~ definitely a treat! Don't even think about willpower! You had me at cream cheese. I've been a baking fool lately and I just swore to myself that I wouldn't make one more treat for a while…sigh. I may have to try this. Just one more and then no more sweets. Girl, I'm not even close to being a carrot cake fan but your description has me wanting a piece now! Sounds delicious. How lucky are you to have such great in-laws?! Hi Lisa, Yum carrot cake is my very favorite! You have great in laws!! 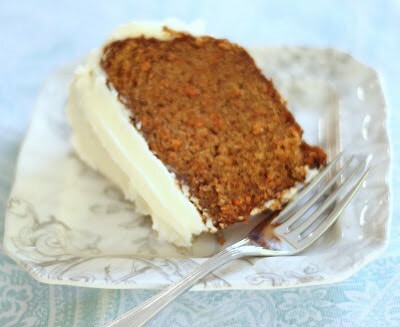 I confess, I've never made a carrot cake, but I love it! Think I'll try it out this week!